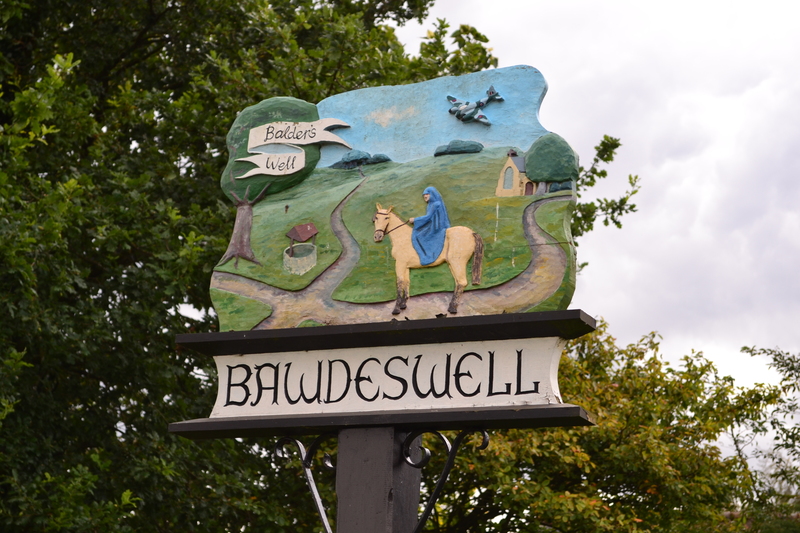 Bawdeswell New Village Sign Reflects the Incident that Night. 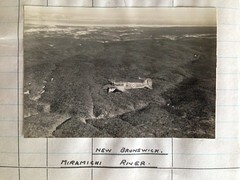 On 1 August 1944, No.608 Squadron (Code 6T) was reformed at RAF Downham Market (also known as Bexwell), initially flying Canadian built DH Mosquitos Mk B.XXs as part of No.8 (PFF) Group Light Night Striking Force. Their primary role was to carry out night strikes as part of the Pathfinder Operations in the German heartland. Targets included: Berlin, Frankfurt, Hanover, Essen, Stuttgart, Nuremberg, Hamburg, Emden and Kiel. This was a role it carried out until disbanding on 28th August 1945. Their first operational sortie was on the night of 5th/6th August 1944, when a single Mosquito took off and bombed Wanne-Eickel. The Chaucer House partly damaged in the accident. 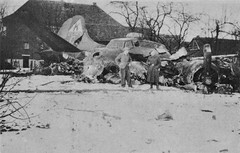 However, it was on the night of 6th November 1944 that 12 aircraft from 608 squadron took off in a diversionary attack on targets at Gelsenkirchen. The idea was to draw defences away from a much larger force attacking both Gravenhorst and Koblenz. The plan was for 608 to begin their attack five minutes ahead of the other forces, a plan that went like clockwork. For one particular aircraft, Mosquito KB364, piloted by Pilot Officer James McLean (26 year old), and Sergeant Mervyn Lambert Tansley (21 year old), both of the RAF(VR), this was to be its final, fatal flight. 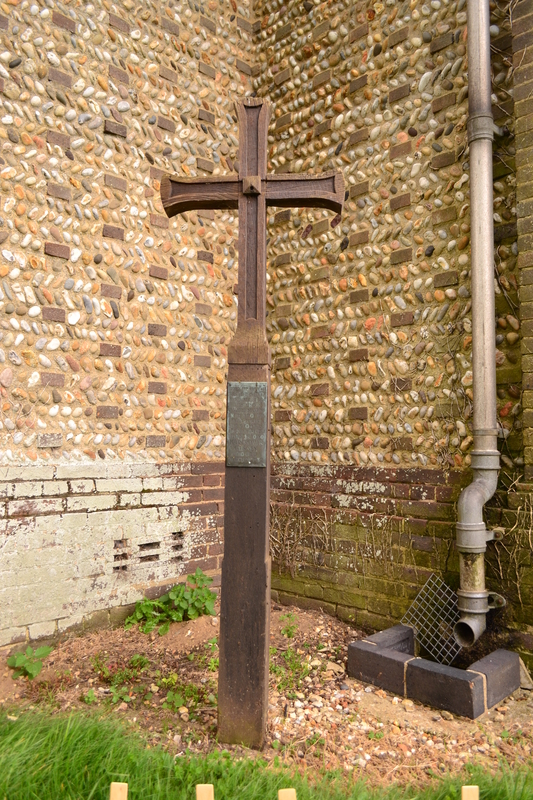 The original cross that stood on the Church tower. Flying in at 25,000 ft, 608 dropped both flares and high explosive bombs, but reported only light flak over the target area. The mission was a success and 11 of the 12 aircraft returned to Downham Market. 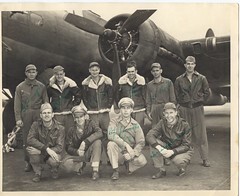 As it was a November night, the air was cold and it is believed that McLean’s aircraft suffered from icing up of the controls. For whatever reason, at 20.45hrs the aircraft lost height and hit some power cables near to Reepham Road, to the east of the village of Bawdeswell (Norfolk). It then careered into All Saints’ Church setting it alight. 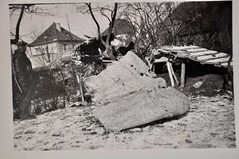 The impact was such that parts of the aircraft struck two other homes, including the Chaucer House*, opposite the church, causing extensive damage to both properties. 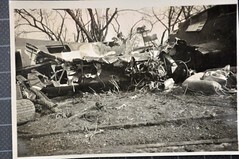 The church was completely destroyed in the crash. 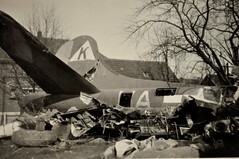 Sadly, both Pilot Officer McLean and Sergeant Tansley were killed, but there were no other casualties from the incident. 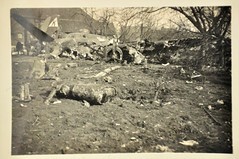 The fire was so ferocious that it took four hours to extinguish, and required both local crews and those from the nearby American airbase at RAF Attlebridge. 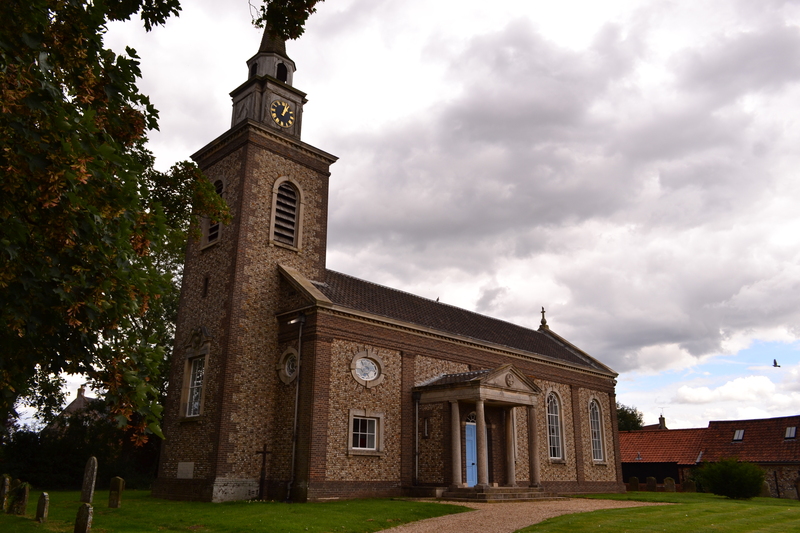 The church has since been completely rebuilt, and as a reminder, the orignal cross stands outside the entrance. This cross miraculously remained untouched by the fire. 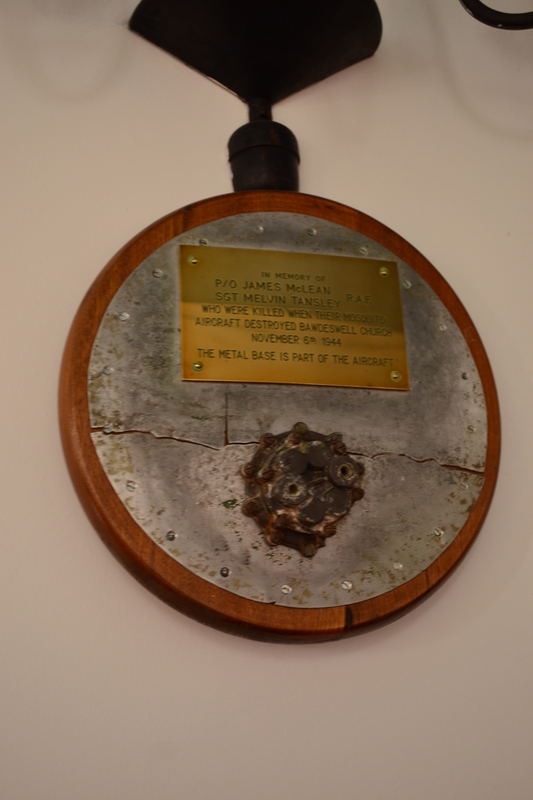 Inside the church, a remnant of Mosquito KB364, has been made into a memorial plaque in remembrance of the two courageous crew who died whilst carrying out their duties that night. Pilot Officer James McLean was buried in Tranent New Cemetery, East Lothian, Scotland and Sergeant Mervyn Lambert Tansley was buried in Fulham Old Cemetery, City of London. 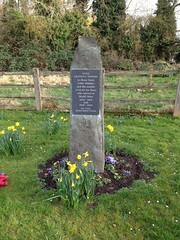 The memorial plaque made from the Mosquito. The Reeve’s Tale magazine website has eye-witness accounts, and further details of the incident. 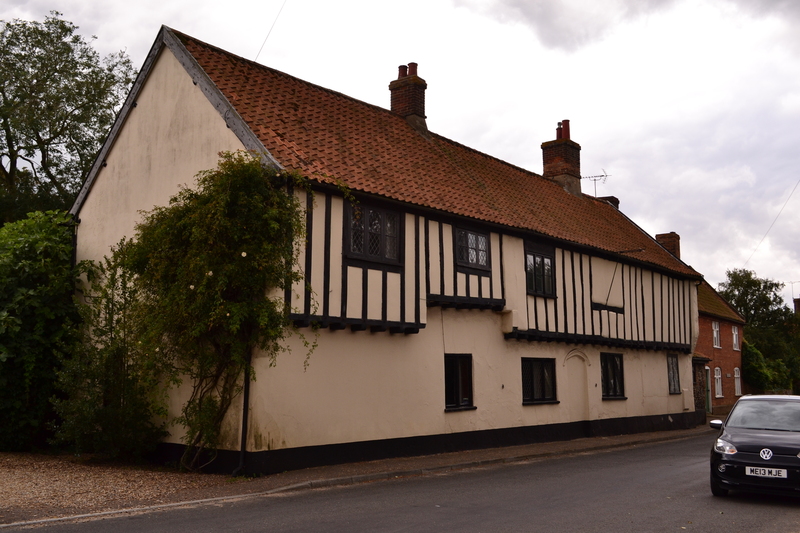 * Geoffrey Chaucer’s (Canterbury Tales) uncle was believed to be the rector for Bawdeswell and the old timbered house opposite the church known as ‘Chaucer House’ may have been his rectory.